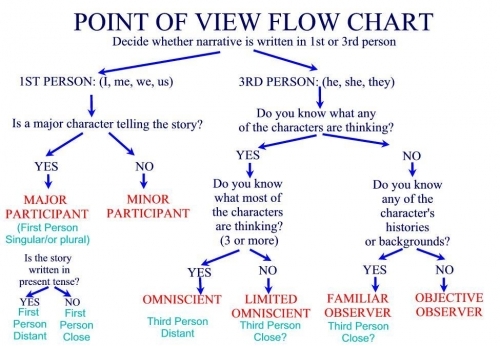 Which POV Should You Use in Your Narrative..? When we create a narrative, our first priority is to decide on which point of view we want to use, the narrative perspective or mode. First person, second or third. Each has it’s own guidelines and enables us to manipulate the reader into the mindset of the character or characters we wish them to sympathize with. As the author we are the omnipresent voice, the one who directs the action and reveals the plot. Whose thoughts, feelings and decisions we reveal to our readers can make a great deal of difference in how the story flows and if you want more mystery to the outcome or highlight your characters internal struggle. No matter which mode you use, you decide on the direction of the tale and what to reveal and what to hide throughout the story. Which mode do you use or prefer to use? Have you tried all narrative modes? Some great information in choosing what narrative to use. To me, it depends on the story and writer. We have to do what we feel is best for the story whether it’s a popular choice or not. Just because a majority doesn’t agree with something doesn’t make it wrong.